The second nor'easter in a week is expected to trigger commuter headaches and snarl travel Wednesday across much of the northern Mid-Atlantic and Northeast. Numerous winter storm warnings and advisories were in effect for about 48 million people from Maryland to Maine. A mix of light rain and snow was beginning to move through the region Wednesday morning, although forecasters warned that snow would ramp up and accumulations could easily surpass one foot or more for some areas west of the I-95 corridor by Thursday night. "The interior Northeast is about to experience one of most difficult evening commutes in memory," said NBC News meteorologist Bill Karins. "The fear is drivers will get stranded on the roads when snow falls at 2 to 3 inches an hour. Plows will not be able to keep up." Authorities planned for the worst, not knowing whether they would actually get hit. Ari Sarsalari, a meteorologist for The Weather Channel, said the freezing line dividing snow from rain was expected to snake directly through Boston and Providence, Rhode Island. Boston is expected to get 1 to 3 inches. A flood watch was set for Boston from early Wednesday into Thursday, while coastal parts of New York were due to be under a flood advisory Wednesday afternoon. Early predictions for the snowfall totals ranged from 6 to 9 inches in Philadelphia; 6 to 12 inches in New York City; 8 to 12 inches in Albany, New York; 12 to 18 inches in Worcester, Massachusetts; and 12 to 16 inches in Portland, Maine, forecasters said. Although there remains uncertainty over how much snow will fall, the heavy precipitation will likely cause significant problems for New York's subway system, said Joe Lhota, chairman of the Metropolitan Transportation Authority, or MTA. "The MTA is taking this storm very, very seriously," Lhota said in a conference call with reporters. "We're ramping up all of our operations, and we will be prepared." And New York Gov. Andrew Cuomo told reporters: "The situation becomes more complicated because we haven't yet finished cleaning up from the first storm, and we're concerned about a compounding effect where tomorrow's snowstorm, which is supposed to be significant, may delay the repairs that we're in the midst of." By Wednesday morning, more than 2,000 flights had been canceled in the United States, according to FlightAware.com, with more than 1,500 of them at the big three New York-area airports. Amtrak said its Northeast Corridor services would run on modified schedules. 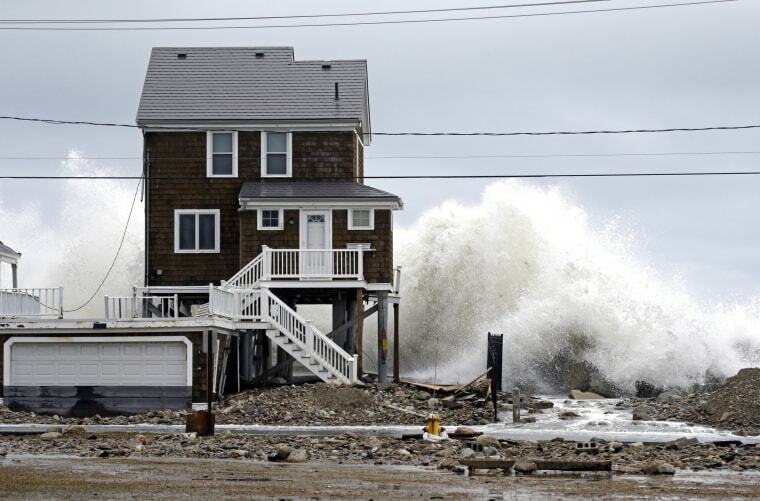 Hundreds of thousands of Americans were left without power and at least nine deaths were said to be related to the first nor'easter that thrashed the East Coast with heavy winds, rain and snow over the weekend. More than 100,000 customers still remained without power Wednesday morning, including in New York, Pennsylvania, New Jersey, Maryland, Virginia, Delaware, Connecticut, Rhode Island and Massachusetts, utility companies reported. In Duxbury, Massachusetts, authorities and property owners were rushing to beef up the remains of seawalls that buckled on Sunday and collapsed on Monday. "They're not even going to be able to pump out all of the water now, so they're going to have to wait until Friday morning," Joe Soares, a resident of Duxbury, told New England Cable News. Another local, Rene Riley, told the station: "We knew it was going to fail at some point, but we didn't think it would fail as quickly it did." On its way east, the storm system created whiteout conditions in parts of the Northern Plains and the Midwest, which were pummeled with high winds and heavy snow. It was believed to be responsible for the death of a woman in Adair County, Iowa, before dawn Tuesday, according to an Iowa State Patrol accident report. The SUV in which she was riding lost control on a snow-covered highway, over-corrected and struck an oncoming car head-on, according to the report. Sgt. Nate Ludwig, a spokesman for the State Patrol, told NBC affiliate WHO of Des Moines that two other people were being treated at hospitals with unspecified injuries.